The PM-60 Pulse Oximeter is a miniature, lightweight device capable of spot-check and continuous monitoring of SpO2 and pulse rate. You determine the capabilities and performance, depending on the operational mode you choose. For simple vital signs checks, spot-check mode offers basic functions including auto-assign of patient IDs, alarm suppression state and auto-standby and power-off features. For longer-term monitoring, continuous mode offers manual entry of unique patient IDs, alarm management and pleth waveform display. 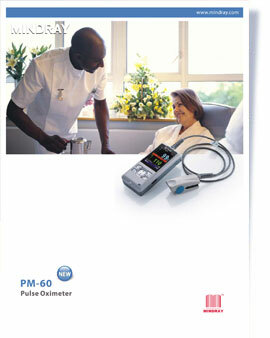 If pulse oximetry varies from day to day, or perhaps hour to hour, PM-60 is ideal as your device of choice.